GERMANY, January 10, 2018 (LifeSiteNews) – Bishop Franz-Josef Bode, the Vice President of the German Bishops' Conference, has called for a discussion about the possibility of blessing homosexual relationships. He believes there to be “much [that is] positive” in such relationships. The new statement from Bishop Bode comes in the wake of a recent interview given to the German journal Herder Korrespondenz by Cardinal Reinhard Marx – President of the German Bishops' Conference and papal adviser – in which he proposed that the Catholic Church rethink her teaching on sexual morality in which he argued against “blind rigorism.” For him, it is “difficult to say from the outside whether someone is in the state of mortal sin.” Marx applied this statement not only to men and women in 'irregular situations,' but also to those in a homosexual relationship. In the new interview with the German regional newspaper Neue Osnabrücker Zeitung, Bishop Bode made remarks which have already led to a vivid discussion in Germany, with conservative Catholics like Mathias von Gersdorff and Dr. Markus Büning raising their voices in protest. 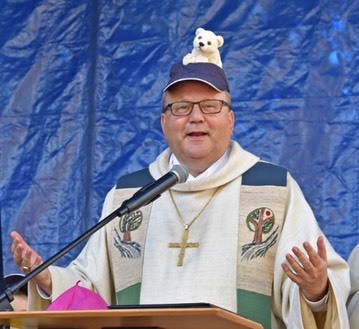 “I think we have to discuss this matter in more detail within the Church,” says Bishop Bode – who has been the bishop of Osnabrück since 1995 – adding that it does not help to maintain “silence” in this matter.